Meet an all-new Hacker’s Search Engine similar to Shodan – Censys. At the end of last month, security researchers from SEC Consult found that the lazy manufacturers of home routers and Internet of Things (IoT) devices have been re-using the same set of hard-coded cryptographic keys, leaving around 3 millions of IoT devices open to mass hijacking. But how did the researchers get this number? Researchers uncovered these devices with the help of Censys – a new search engine that daily scans the whole Internet for all the vulnerable devices. Censys is similar to hacker's search engine Shodan, which is designed specifically to locate any devices that have been carelessly plugged into the Internet without much attempt at preventing unauthorized access. However, Censys employs a more advanced method to find vulnerabilities in the devices and make the Internet a safer place. 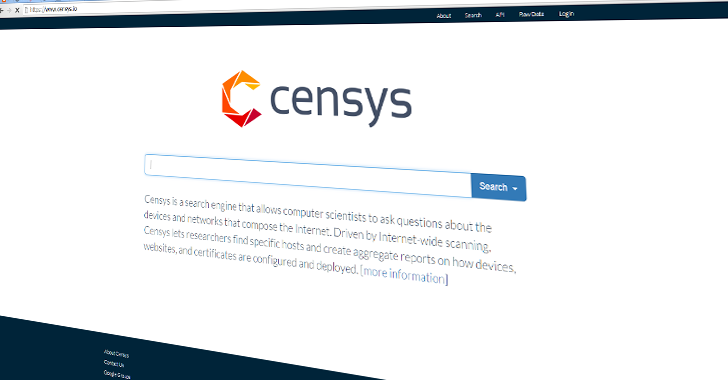 Censys is a free search engine that was originally released in October by researchers from the University of Michigan and is powered by the world's biggest search engine Google. Censys is part of an open source project that aims at maintaining a "complete database of everything on the Internet," helping researchers and companies unearth Online security mishaps and vulnerabilities in products and services. Censys collects information on hosts and websites via daily scans of the IPv4 address space – the internet protocol version 4 that routes the majority of the Internet traffic today. Censys then maintains a database of how hosts and websites are configured, allowing researchers to query the data through a search interface, report builder, and SQL engine. ZMap scans over 4 Billion IP addresses on the Internet and collects new data every day. It also helps determine whether the machines on the internet have security vulnerabilities that should be fixed before being exploited by the hackers. "We have found everything from ATMs and bank safes to industrial control systems for power plants. It's kind of scary," said Zakir Durumeric, the researcher leading the Censys project at the University of Michigan. Obvious flaws in addition to issues caused by IT administrator failures can also be found. Here's the MIT Technology Review on Censys, titled "A Search Engine for the Internet’s Dirty Secrets." More details on the Censys architecture and functionalities are available in the team's research paper. If you would like to give Censys a try, you can follow the step-by-step tutorial offered by the developers.